Iranian student activist, Payman Aref, was sentenced to one year in prison for his role in the post-(S)election protests, but he was also sentenced to 74 lashes for insulting Ahmadinejad. In fact the 'insult' was nothing other than a polite open letter to Ahamdinejad. 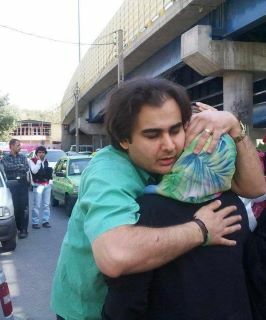 Today, Payman Aref received his 74 lashes. US anchormen who carry out uneducated interviews with Ahamdinejad seem unable to challenge him when he spurts out sentences like 'Iran is the freest country in the world and anyone can criticise me' and it is left to people like Payman Aref and Somayeh Tohidlou who show the hollowness of Ahmadinejad's regurgitations with their wounded flesh and skin. This is torture, no less!But no one says a word.The whole of the western media and governments are crawling to that loser! So sickening!! Well if Ahmandinejad recently blamed Iranian droughts on Western devices diverting the clouds away from Iran - not only does he deserve derision but also the rubber room!!! And when it comes to the media, you do wonder if there is this great paid off network to treat the Islamic Republic with kid gloves? Even Al Jazeera doesn't seem that interested in covering any turmoil or protests in Iran? ...Again, you only have to look at our great friend PressTV don't you? To them Iran is this great land of milk and honey. All bad news is ignored or deflected in favour of government propaganda news. The channel deliberately allows a multitude of anti-Zionist/US/UK/EU and now even Saudi Arabian programmes and comments. And it's blatantly geared to be soft and sympathtic towards Assad's murdering regime by more or less condoning in him what it condemns for purely political opportunistic gain in the likes of Bahrain and Yemen. Again, it boggles belief that OFCOM allows such a dictorship channel to pollute Britain with all it's seditious and insidious attacks upon OUR democracy. But then again, just who and what does the Revolutionary Guard's gold now actually nobble abroad?